A woman walking her dogs noticed a beautiful Red fox in a field seemingly held to the ground, unable to escape. When she observed him, he was frantic and had worn a wide circle of blood in the snow and dirt below as he struggled for hours, unable to free himself from the painful jaws that held his foot. This was a far cry from “sleeping peacefully” like the trappers tell us animals do when held in a trap. His mate had also worn a path in the snow as she paced nervously, wondering why her handsome mate couldn’t continue loping along with her, stopping occasionally to hunt for rodents. Set like a mine field, the area behind the church is full of traps like this. The trapper set the traps there without permission, and when he had his fill of killing and skinning his catches, he just abandoned the area- leaving his traps behind, still set. The pile of skinned foxes and other dead wildlife in the corner of the field is proof of his selfishness and lack of compassion. These are large traps, suited for catching coyotes. 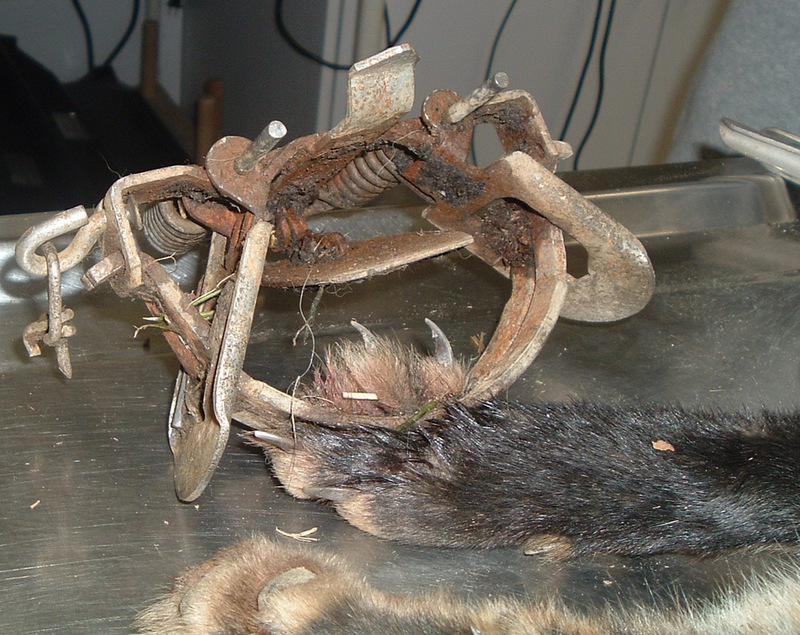 A trap like this will destroy the foot of any animal that steps into it. Fortunately though, for every man lacking compassion for animals there are at least 10 people that do care and will try to undo the damage that this one person caused. We worked quickly to arrive at the scene and secure the fox so that he couldn’t cause more damage to his foot by pulling and struggling. 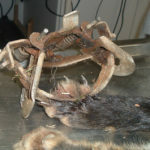 Unable to free the foxes foot from the frozen, rusty metal, others ran to a hardware store for a heavy duty wire cutter to cut the chain to the stake. Phone calls were made to the local SPCA Wildlife Center to prepare them and their wonderful vet for the patient soon to arrive. By the time we arrived, they were ready for us. Tools had to be located to open the device on the foxes foot. 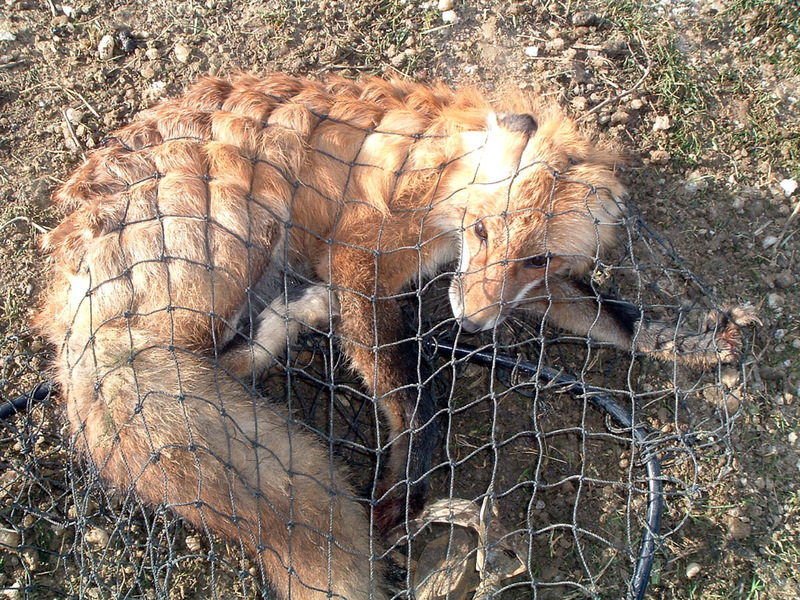 Everyone recoiled at the sight of the trap and the damage it had done to this beautiful fox. At last the foot was free but irreparably damaged. There was a lot of dirt and debris in the wound and infection was a risk. The veterinarian, assisted by many caring individuals, got right to work cleaning the foot, shaving it and preparing the fox for surgical amputation of three of his toes. It was wonderful to assist and watch this skillful and compassionate team help an animal that had been hurt so badly by one selfish trapper. Many folks that were watching this event commented “I thought those things were outlawed- they still use things like this?” Meaning of course, that they were surprised that the practice of trapping still existed. Yes, unfortunately it does. No one makes much money on it, so one must wonder why so many animals have to suffer and die in vain? Surely we don’t need to wear fur still? It is vanity that makes some wear it. Most of the furs go to Russia and China. How can people kill our wildlife for a few bucks- beer, gas and cigarette money is all it amounts to. Isn’t our wildlife worth more than that? It is our wildlife too, and we don’t want it trapped and killed like this for fur. Don’t believe the lousy excuses the trappers make for their cruel hobby- they aren’t controlling animal populations for us! They are creating imbalances. They don’t control wildlife diseases either – they are catching the healthy animals, not the sick ones. Coyote numbers rebound ten fold when members of a local population are killed by trapping and shooting. This creates larger numbers than ever. Don’t be fooled by the trapper cliche’s . There is no use for it and it only creates suffering, death and destruction for our wildlife. Be sure to check out the photo page of the fox and the injuries to his foot. The column on the left lists the different photo albums, click on the one that says “A Trap Injures a Red Fox” to see more photos. We will keep adding photos until the fox is released safely back into the wild to be with his mate. Clicking on the photos will enlarge them.